Dodgy At Best: Can Clarkey Defend His Title? Can Clarkey Defend His Title? Forget whether Phil can defend his Masters title. Can D Clarke defend his 2006 Pimp Of The Masters title? 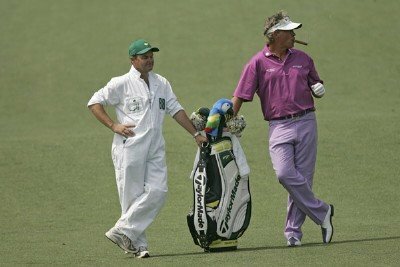 The winner of the 1st Annual Pimp Of The Masters title is none other than Darren Clarke on day 1. With Jesper Parnevik & Ian Poulter not qualifying for the tournament this year Clarke was always the favorite, but he lived up to his reputation and came out with guns (and cigars) blazing on Thursday. A tremendous effort that looks a) sharp as hell b) like a Las Vegas driving range pro from 1982 c) what TCU football fans would look like if they adopted to the University of Tennessee's gameday dress code which states that fans must wear multiple articles of school color clothing that to not match in their shade or tone. "I'll go ask her for her phone number, Clarkey. thinking about this 5 iron from 198 that we have left?" Will Ian Poulter make a run at Clarkey? Gary Player, perhaps? Or will a new pimp emerge to claim greatness? Whomever it is, it is safe to say that is will be a Euro or international and certainly not an American.